Jane Iredale is a rather well-known brand of makeup. The company produces everything from concealers to brushes and beyond. But their most popular products are their foundations. The two JI is best known for are PurePressed Mineral Foundation and the Liquid Minerals Foundation. Below we provide a detailed review of each of these products, list their ingredients, discuss consumer opinions, and more. PurePressed is a very light, sheer foundation that is designed to blend better and look more natural than standard loose powders. It is made using mostly natural substances, nothing that’s created in a lab. It’s also water resistant, although mostly in light rain or drizzle and only for about 30 to 40 minutes. The foundation also serves as a great powder and concealer and contains a broad-spectrum, SPF 20 sunscreen to protect your skin from the harsh rays of the sun. PurePressed is also approved as hypoallergenic. 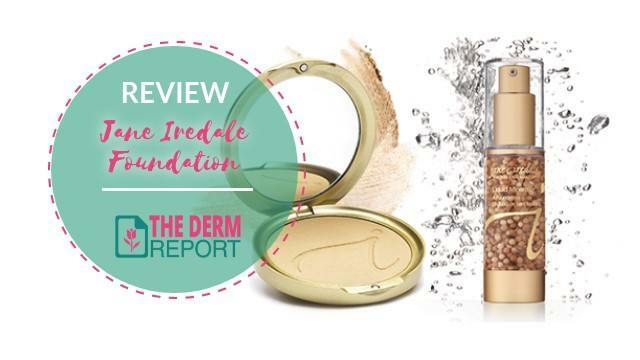 This Jane Iredale foundation isn’t the cheapest, but it’s worth every penny. CLICK HERE to check current prices now. Another popular option that this company offers is their Liquid Minerals Foundation. As the name suggest, this is a liquid-base product rather than a powder. It provides a shinier and more moist appearance when applied but is still lightweight. It is not quite as sheer as the PurePressed but it does provide decent hydration and can help reduce the appearance of blemishes, wrinkles, and other common skin issues. Another drawback of using Liquid Minerals is that it does not contain a built-in sunscreen like PurePressed. This means you’ll have to couple this product with a decent sunblock such as Obagi Sun Shield to guard your skin from damage dealt by exposure to sunlight. The formula of this foundation differs, too. Unlike PurePressed, Liquid Minerals does contain some synthetic substances. It is, however, wheat-free and approved for use by vegan organizations. The solution is also hypoallergenic. We’re strong believers in knowing what cosmetics are made of before applying them to your skin. After all, everyone is a little different. Some people are allergic to certain substances and others just have awful reactions to certain chemicals. So, you should ALWAYS know the ingredients of a product PRIOR to purchasing it. Below we list the ingredients found in both of these foundations. In other words, the majority of the substances found in either of these products consist of plant extracts. No synthetic substances are found in the PurePressed but there are a few in the Liquid Foundation. So, if you have drier skin, you may want to look at another foundation or pair Jane Iredale products with high-quality moisturizers to ensure that your skin doesn’t dry out more and flake. Aside from that, very few people have had any issues using these foundations. What can I say about this? It’s a compact to hold make up. I think it’s a bit overpriced on it’s own and I probably wouldn’t have purchased it separately if I didn’t get it practically free with a promotion. But since I did, now that I’ve received it it’s certainly beautiful and luxurious feeling. If you have the dollars to spend on it, I would say why not? If you can purchase them together on the Jane Iredale website for a savings then probably do that. I purchased the product separately at this time however, so this worked for me. I’ve added some photos so you can see for yourself. Always wanted to try Jane Iredale and am glad I did. I was previously using Merle Norman foundation and it was just too thick. Jane Iredale goes on smooth and covers, but not with a make-up look. Feels good on my face. I’m a fair to medium skin type with some freckles and I use Satin. Apply with a brush blending well. Finish with your favorite hydration spray. Apply evenly all over face with Foundation Brush or Flocked Sponge. Follow with Amazing Base or PurePressed Base. As you can see, the majority of people have found these foundations to be among the best products they’ve used. There are a few low ratings as the products do have a few flaws, but, for the most part, everyone agrees that these foundations are superb. It is just that these products are not recommended for people with dry skin. jane iredale Flocked Sponge, 0.07 oz.